I’ve been wanting to mount my phone to a GorrilaPod for a while. Having shot ~60 gigs of video on my iPhone while on parental leave over the last 6 months, I wish I would have done this hack sooner. Joby offers the GripTight smartphone mount. Here’s an interesting adaptor called the Smart-Mount. 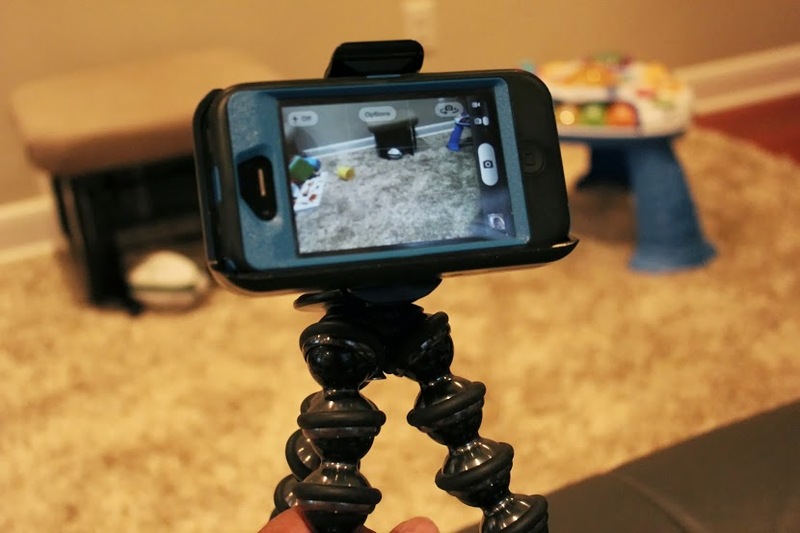 Here’s a printable Gorillapod Phone Mount on Thingiverse. I was looking for a cheaper solution that would accommodate my phone inside its case. It turns out I already owned something that could be hacked easily into a tripod mount. The OtterBox Defender case comes with a belt-clip holder that I’ve never used. I drilled a hole in the belt-clip holder for the front facing camera and LED with 1/2 inch drill bit. I used a circular file to make the hole a little bit bigger to avoid vignetting. I then bent a 1/4 inch-20 t- nut, so that it would fit flush with the clip stand on the back of the holder. I drilled a hole in the clip stand for the t-nut and secured it with super glue. The GorillaPod quick release plate screws easily into the t-nut. The quick release can then mounted back on the tripod. With the phone in its case, it can then be secured into the belt clip as designed. The total cost of this hack was 25 cents for the t-nut. The only drawback of this hack is that it limits the functionality of the belt-clip if you’re not using it as a tripod mount. As this hack is quite popular, I wouldn’t be surprised if OtterBox incorporates a tripod mount design into future iterations of their cases and belt holders.